If you want a low-cost robot vacuum with basic features and functionality, they’re a dime a dozen on Amazon. You can get some great models in the $100-$250 range, but don’t expect them to perform anywhere near as well as higher-end robot vacuum cleaners that pack in more tech and features. If you’re on the hunt for the cream of the crop, there’s a brand new model that just debuted on Amazon and you’re definitely going to want to check it out. 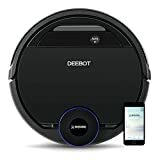 The ECOVACS DEEBOT OZMO 930 Smart Robotic Vacuum offers just about every single feature you can want in a robot vacuum, and much more. It features both Alexa and Google Assistant integration, as well as a fully autonomous mode that uses sensors to map your room and to prevent bumps and drops. It’ll run for up to 100 minutes per charge before navigating itself back to the base station to power up. Once recharged, it’ll pick up right where it left off. We tested the new OZMO 930 and we came away very impressed. It’s a pricey model at $599.99, but it works better than any other model we’ve tested on hard flooring and on low-pile carpet. It tackled dog hair with no problem, and it’s worth noting that my dog is a heavy shedder. And finally, this model has two awesome features you won’t find on even the most expensive Roomba models out there. First, it senses when it moves from hard flooring to carpet and it’ll automatically double the suction. Second, it has a great mop feature built in! Specialized water pumps and a mopping pad transform this robot vacuum into a robot mop, and it’ll automatically avoid carpeting while in mop mode.